The MMBC Lake Travis tournament results in the Gold’s taking gold, again. That makes three tournaments in a row that the team has placed first! Great job. As most would agree, Lake Belton can be a hit or miss lake. Most of the MMBC teams that arrived at Temple Lake Park Saturday morning completely missed the target as they aimed to bring a limit of bass to the scales. As the tournament began, the day looked to be promising with a light wind and slight cloud cover. Conditions seemed optimal for some good central Texas bass fishing. However, as the day progressed and temperatures soared into the mid 90’s, most competitors realized that the fishing conditions would be very tough. Of the eight teams that participated zero of them managed to bring a limit of bass to the scales. Speaking of zeros, half the field brought absolutely no fish to the weigh in at all. A tough day indeed. 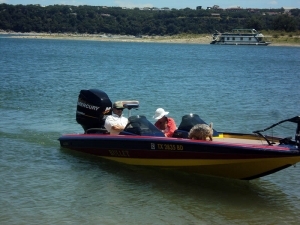 The team of Pat and Jerry Gold managed to round up four finicky Lake Belton bass and take the win fishing out of their flashy new Bullet boat. Jerry boated a hefty 5.51 pound Belton bucket mouth which took men’s big bass and anchored their sack of 9.59 pounds. Great job guys on a very tough day of fishing. Continuing their hot streak and finishing in second place was the team of Rosemarie and Pete Trevino. They managed to bring three bass to the scales weighing 5.90 pounds. Rosemarie took women’s big bass honors with a 2.15 pound largemouth. In third place with two bass weighing 3.02 pounds was the team of Leslie Killough and Brent Parish. The last team to bring fish to the scales and finishing in fourth place was Brenda and Cliff Davis with one bass weighing 1.22 pounds. The rest of the competitors only managed to bring in empty livewells to the melting asphalt of the Temple Lake Park parking lot. It was a truly tough day of fishing and surviving the sweltering heat was an accomplishment in it’s self. Club members now set their sights on Lake Stillhouse hollow where the July tournament will be held in the cool of the night. Just five days after returning from Lake Amistad seven teams of the Mr. and Mrs. Bass club of Austin were at Lake Buchanan competing in the May club tournament. The lakes had some things in common, beautiful water and surroundings. What Buchanan did not have in common with Amistad was 14” fish. Catching a fish of any size was quite difficult but finding one over 13 ¾” was amazing! As is usual one team managed to throw a bait the fish seemed to want. Cliff and Brenda Davis had a five fish limit weighing in 8.81 pounds. Brenda had a 3.01 which was women’s big bass of the tournament. 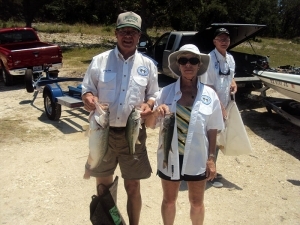 Coming in second was Rosemarie and Pete with 3.39 pounds and Pete had men’s big bass with a 2.24 pounder. Jesse Sanchez had to fish solo because Sugein was ill and stayed home. Jesse weighed in 2.92 pounds which took third place. The Brown’s, Connell’s, Tyree’s and Gold’s rounded out the field. The only time anyone saw the Gold’s they were a “swish” mark on the lake in their new Bullet being pushed by a 300 horsepower motor. She’s a beautiful boat and very fast too! Congratulations Jerry and Pat on your new baby. It wasn’t a good day for catching bass but it was a nice day on the lake and the wildflowers made the trip more than worthwhile. Bluebonnets, Indian Paintbrushes, Brown eyed Susan’s and Firewheels carpeted the roadsides and fields. If the bass in the lake could have seen the scenery surrounding them they would have been jumping into our boats for a glimpse of the beauty. After the tournament we all went to Storm’s restaurant in Burnet for food and talk. The social time spent after the tournament is almost as much fun as the fishing. 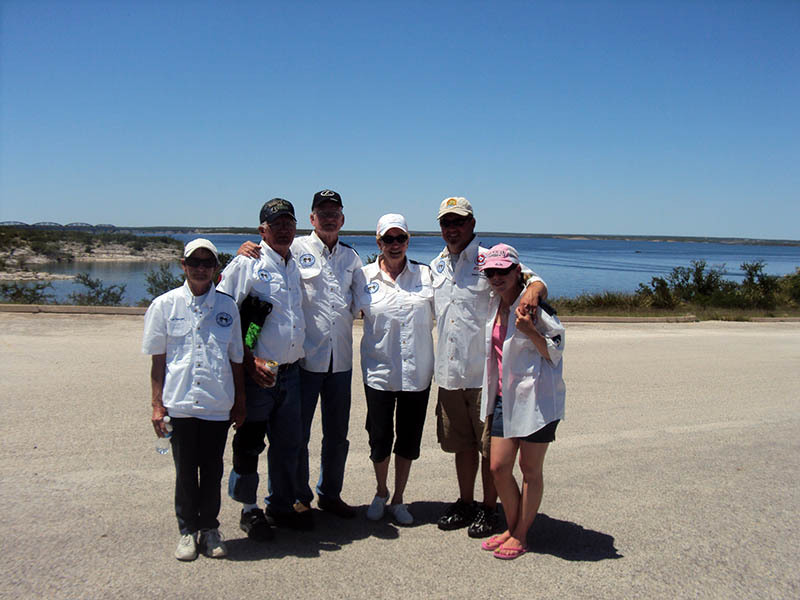 Twelve MMBC teams headed to the clear blue waters of beautiful Lake Amistad on the weekend of April 24th and 25th to test their fishing prowess against the bass that dwell there. All “hail” broke loose Friday night as a large storm blew through bringing with it deadly tornados, heavy wind gusts, plenty of rain and even some marble sized hail. Luckily the storms did not last too long and the only thing left behind was 20 mph plus winds to greet the anglers Saturday as they took to the water at 7:00am. Saturday’s weigh-in would be held at Diablo East ramp at 4:00pm. Over the course of the weekend water temps remained in the upper 60’s and air temps were very pleasant starting out around 60 degrees in the morning and warming to the low 80’s by the end of both fishing days. 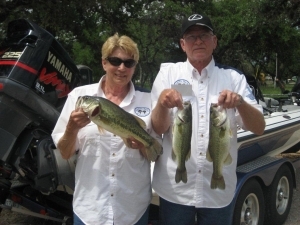 Most couples stayed at the very accommodating Angler’s Lodge during their time in Del Rio TX. Many bass had already spawned which was evident by the abundance of abandoned beds scattered across the shallows. The full moon was approaching again which instinctively lead the second round of spawner’s to the shallows to perform their annual mating rituals. Despite Lake Amistad’s crystal clear waters, sight fishing was not the predominate pattern. Many will tell you that blind casting to likely spawning areas from a distance seemed to produce the best sacks over the course of the weekend. Slow moving baits, or dead sticking seemed to be the ticket for the bigger fish. 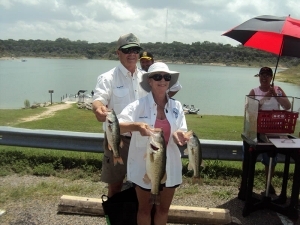 The fishing was typical Lake Amistad for this time of year. Despite the ferocious winds, reports of 50-80 bass being caught per day were buzzing around the weigh in on Saturday. Eight limits of bass were brought to the scales on Saturday many of which were quite impressive. It hard to beat a lake that can yield three sacks over 18 pounds and three more over 14 pounds. Day one ended with Pat and Jerry Gold in the lead with a limit which was half a pound shy of the twenty pound mark and was anchored by the 7.35 pound men’s big bass of the tournament. In second place after day one were Brenda and Cliff Davis with a hefty 18.34 pound limit. Rounding out the day one top three was Gail and Larry Pederzani with another quality 18.13 pound stringer. Saturday evening we celebrated the good fishing at Anglers Lodge with home made grilled burgers and more sides than we could possibly consume which is fairly typical for the Mr and Mrs Bass Bass Club of Austin. After supper we shared laughter, fishing stories and time with good friends. We were also all amazed by the fact that Jessie Sanchez actually ate that whole burger although it was not without a struggle. Way to go Jessie! By Sunday the winds had laid which made the fishing much easier. However, for most couples, the catching seemed to be more difficult since only two teams were able to bring in more weight than they did on Saturday. The tournament began at 6:30am and weigh in was held at 2:00pm. The top three finishers on day two were Lesli and Robert Brown with the largest limit of the tournament weighing an awesome 22.11 pounds. Their sack was full of Mexican bass that were the size of piñatas! Day two second place went to Brenda and Cliff Davis with a 16.77 pound limit and finishing third on day two was Gail and Larry Pederzani with a nice 15.95 pound limit. Nine limits of bass were brought to the scales Sunday but the average weights were less than Saturday. After the weights were tallied, Brenda and Cliff Davis found themselves on the top of the podium with a two day total of 35.11 pounds. Gail and Larry Pederzani took second place honors with 34.08 pounds and woman’s big bass of 4.84 lbs which is also now the new woman’s big bass of the year. Third place went to Lesli and Robert Brown with a total weight of 32.57 pounds. Congratulations to everyone who fished this tournament. I think it’s safe to say that everyone had a great time! I want to thank our tournament director, officers and the others who helped make this tournament fun and successful. Thank you to each and every one of you all. We meet next weekend on the waters of Lake Buchannan for the first time in several years. It should be an interesting tournament. See ya there! Eleven MMBC couples took to the waters of Lake LBJ Saturday March 27, 2010. Fishing times were 7:00am to 3:00pm. This early spring day started off fairly pleasant, with a light breeze and air temperatures in the fifties. Water surface temperatures started out around 58 degrees but as the day progressed and the warm spring air and sun did their thing surface temps could be found over 65 degrees. However, as it happens routinely in the spring, a northern cold front came blowing in a little after noon which unsettled the lake LBJ waters by whipping up some pretty good sized rollers. 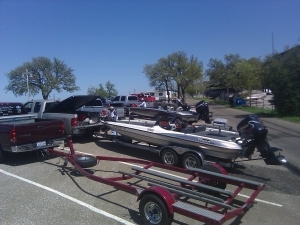 Most teams arrived at Cotton Wood shores a little wet for the 3:00pm weigh in. 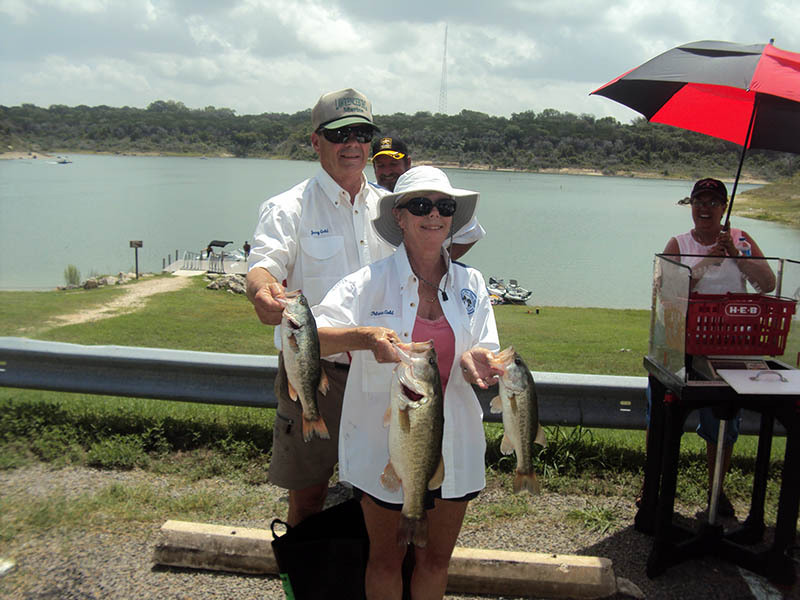 The team of Leslie Killough and Brent Parish came out on top for the second time in a row when fishing on Lake LBJ. They brought an impressive five fish limit to the scales weighing 17.75 pounds. Their sack was anchored by a 7.67 pounder caught by Brent. Despite the size of the kicker fish, it was still not large enough to take the men’s big bass award. That honor went to Larry Nichols who boated a beautiful 7.91 pound lake LBJ lunker! Women’s big bass went to Pat Gold’s 3.48 pound largemouth. 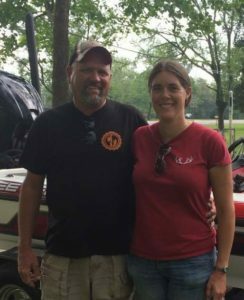 In second place, and fishing very consistently so far this year, was the team of Lesli and Robert Brown. They had a 5 fish limit weighing 10.88 pounds. Close behind in third place was Rose and Pete Trevino weighing in a limit of bass for 10.25 pounds. Congrats Rose and Pete for a top three finish! Rounding out the top five teams were Marilyn and Joe Connell with another limit which weighed 9.85 pounds. And no 2010 tournament story would be complete without having to mention our newest couple Sugein and Jessie Sanchez who have been on fire so far this year. They are the current anglers of the year and on this day they brought four bass to the scales weighing 9.17 pounds. Great job to everyone who participated. Overall it was a pretty good day of fishing. In typical fashion, we rewarded our efforts with a big meal and great company at the Chinese food restaurant in city of Marble Falls. We now set our sights on the big blue waters of Lake Amistad for our spring two-day tournament on April 24 and 25th. We hope to see everyone Tuesday April 6th at Fudruckers for our monthly meeting. Please don’t forget to bring any stuffed animals you may have for our ongoing charity contribution to Blue Santa. Marilyn put together some statistics for our tournament compared to the FAN tournament held on LBJ at the same time the MMBC tournament took place. Cool stuff, thanks Mayilyn!